The co-operative called their settlement Ruskin Mills after British critic of art, architecture and society John Ruskin. Aug. 18, 2015 3:00 p.m. In November 1895, in Mission City, 10 men formed the Canadian Co-operative Society. Most of them came from the Maritime provinces, where co-operatives were common. They had probably taken part in the layout and early construction of Mission City before the flood of 1894 put an end to that. The group settled on land in Maple Ridge, where Stave and Fraser rivers meet. Samuel Knox Twigge, a Vancouver real estate broker, owned the land and he offered a part of it for free use on condition that the CCS would operate a sawmill there for 20 years. The co-operative called their settlement Ruskin Mills after British critic of art, architecture and society John Ruskin, whose socialist ideas were hugely influential in the last half of the 19th century. The place name Ruskin Mills was used for the first time in the spring of 1896 and the sawmill started running in the fall of that year. The machinery came from a sawmill that had started a few years earlier on the Mission side of Stave River. Using steam-powered machinery was against John Ruskin’s idea that motive power had to be produced by hand, wind, or water, but this was considered an unrealistic throwback, even in Ruskin’s homeland. In January 1898, a post office with the name Ruskin was opened and that year Ruskin was included for the first time in a city directory. All activities shown in the directory were part of “Ruskin Mills Co.” under the management of John T. Wilband, one of the pioneer members of the society. Ruskin Mills Co. was never incorporated. The 1898 directory lists names and occupation of about 30 men, most involved in the production of lumber. The mill employed four loggers, a teamster, an engineer, one millwright, one saw-filer, one shingle sawyer and half a dozen mill hands. By no means a grand operation, yet it was the main source of revenue for the group. Farming was one of the other occupations of the group, mostly for the commune’s own needs. There was not much of a market for produce and dairy products. That was different for lumber products, but the mill’s production was restricted by the capacity of the mill, manpower, a continuous supply of logs, and financial resources. Perhaps the mill was already struggling when during a dry spring in 1898 the water levels of the Stave River were too low to float logs to the mill. Any companionship of idealists with diverse ideas has its controversies, which in this case could have hampered efforts to save the mill for the co-operative. Without the capability or conceivably the common will to continue operating the sawmill, the Ruskin co-operative came to an end and its members dispersed. The mill survived, however. The main creditor of the plant, Edward H. Heaps, operated a sawmill in Vancouver and the Ruskin mill became a Heaps mill. Retooled and again under management of John T. Wilband, the mill restarted in May 1899. Like Wilband a few of the former members of the co-operative continued working at the mill in Ruskin for some time, but most did not stay in Ruskin any longer. 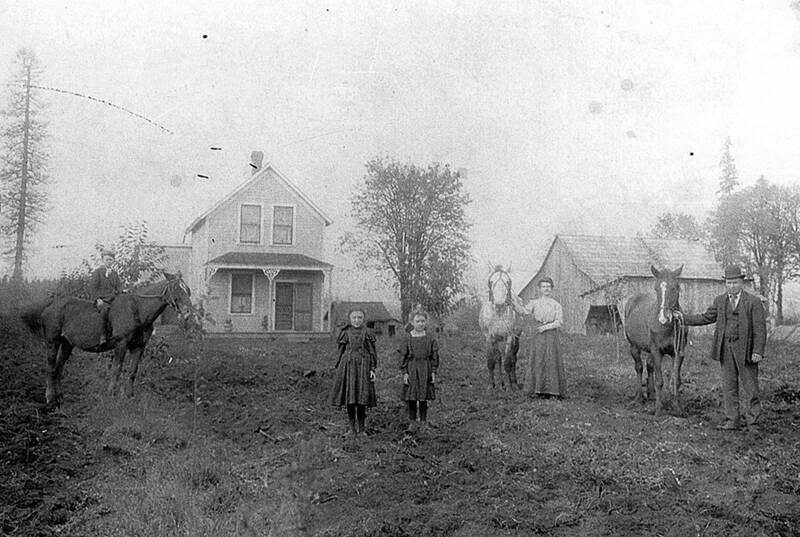 A small group of men and women started a farm in the Boundary Bay area modeled along the lines of Ruskin’s thoughts, but also that effort failed. On paper, the Canadian Co-operative Society continued to exist until 1927. Its lasting legacy is, of course, the name it left to our historic neighbourhood of Ruskin. – By Fred Braches, a local historian who lives in Whonnock.